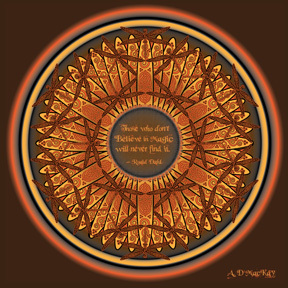 Description: An orange and brown version of the Celtic Dragonfly Mandala. Celtic dragonflies dance around a magical Celtic flower that contains the seeds of Roald Dahl's words, reminding us that magic is everywhere, if we would only just look. The text reads: Those who don't believe in magic will never find it.